This article is about the guest star. For the character, see Kiefer Sutherland (character). 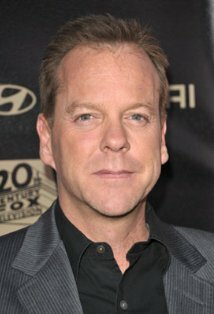 Kiefer William Frederick Dempsey George Rufus Sutherland (born December 21, 1966) is an English-born Canadian actor, director, and producer, best known for his role as Jack Bauer on 24. He voiced an army colonel in the season 18 episode "G.I. (Annoyed Grunt)", Jack Bauer, his character from 24, in the season 18 episode "24 Minutes", and Wayne Slater in the season 23 episode "The Falcon and the D'ohman". He was also interviewed in The Simpsons: Celebrity Friends and The Simpsons: Mischief & Mayhem. A clip of Jack Bauer from "24 Minutes" was used in opening montage of the season 30 premiere "Bart's Not Dead". He is the son of actor Donald Sutherland. Modified on October 4, 2018, at 17:30.